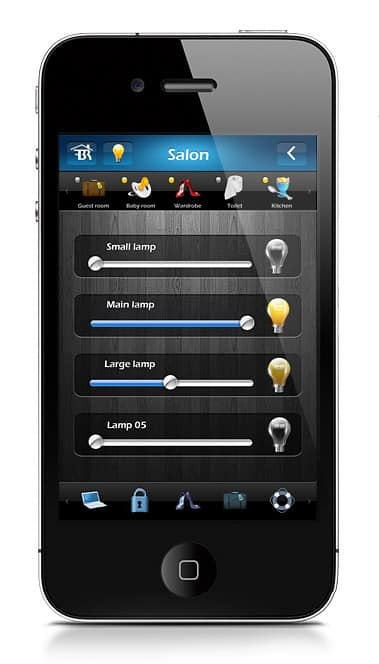 The Fibaro System lets you control all the lights in your house with just a touch of your mobile phone screen. By dimming lights you will save both energy and money. Thanks to the high compatibility of our modules, they can be used to control any kind of lighting available on the market. Make the atmosphere in your house perfectly reflect your mood. At Crown Integrated Systems we help you plan an automation system that perfect for your home. We’ll then supply and fit the Fibaro system. Following this our experienced Fibaro specialists will train you so that you get the most out of your new Fibaro home automation. Contact us now or visit our showroom in Joondalup for a product demonstration. Turn on/off all the lights in a room with just one click. All you need to do to turn the light on/off is click on the "lamp" icon. If you feel like dimming the light to 50% it's no problem, you can do it with the slider. The slider allows you to control light brightness in a smooth way. Fast and clear room viewing provides you with information on where the lights are on.